Front row, sitting (L-R): Gloria Henry, Carolina Cotton, Ann Rutherford, Alvy Moore. Back row, standing (L-R): John Pickard, Gene Evans, Gregg Palmer, "Arkansas" Slim Andrews, Michael Wayne and Gordie Peer. 1990 was a busy year for Carolina. She attended 2 Film Festivals that year. The first was this intimate-but-lively gathering in Little Rock. 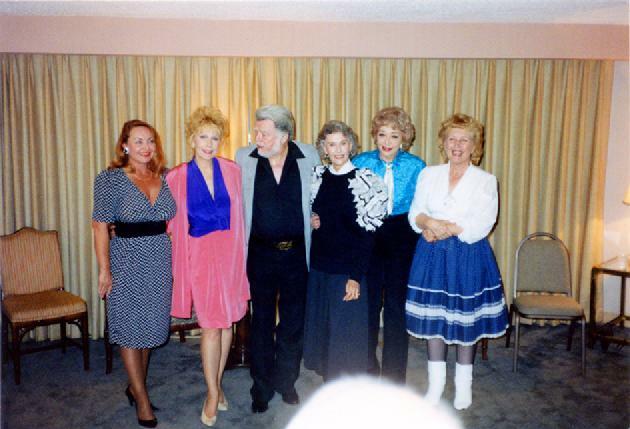 It was a great opportunity for fans to meet the Western stars of the Silver Screen, including those from their Home State. Lash LaRue was not listed in the flyers but also appeared at the gathering. 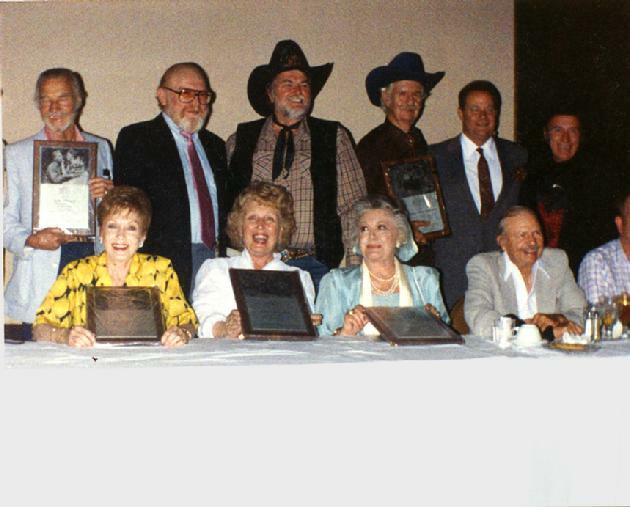 The second Western film gathering Carolina attended in 1990 was in Georgia. The Atlanta Film & Memorabilia Fair VI paid homage to Women In Film. Five lovely ladies of the screen were honored guests. One of Disney's Mouseketeers, Darlene Gillespie, was originally scheduled to appear. Although she did not attend, another Mouse Club member--Doreen Tracey--was a special guest. According to the flyer, Kirk Alyn was scheduled but was unable attend. And many fans were happy to see the ever-popular Lash LaRue. At the Awards Banquet. L-R: Barry nelson, Gail Davis, Jim Schoenberger, Marshal Andy, Carolina, Jane Greer and John Agar. Carolina did not appear in any Film Festivals in 1991-1992. 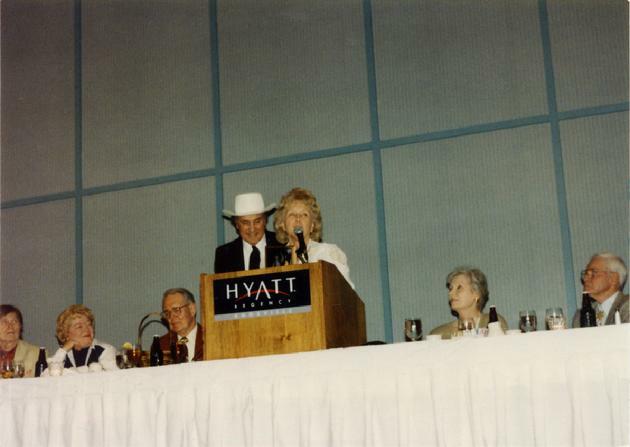 And she was very happy to be back among friends and fans at Knoxville's convention, as she put on a lively show at the Banquet. to be presented at a later time). Ben Johnson was not able to attend, due to obligations at NBC. But a taped phone message was played for everyone at the Awards Banquet.